Recipient of the Congressional Award Program’s Bronze and Silver Medals. Attending the College of New Jersey with a major in marketing and a minor in music – Class of 2013. Member of Kappa Delta Sorority. Recipient of Honorable Mention Award for Excellence in 2009 from Contractors’ Association of Greater New York (CAGNY). Volunteered at Somerset County Medical Center for a total of 300+ hours. Proficient piano player and played “Beautiful” by Christine Aguilera at fundraiser for victims of Katrina. 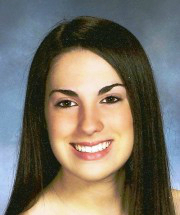 Member of Bridgewater High School Italian Honor Society. Member of MADE club (Make A Difference Everywhere).